So, my final post with Getting Personal is going to be a gift inspiration post for Christmas. Yes, yes, I know it's not even November yet - but if you've been following these Christmas posts you'll know I've been taking part in a scrapbooking challenge, getting myself (and hopefully you!) well and truly prepared for Christmas. 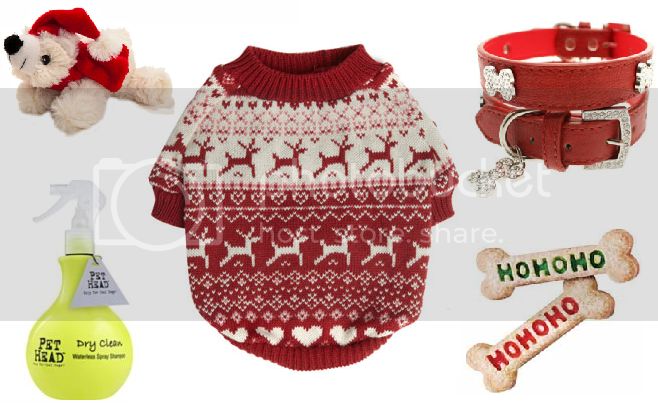 I thought for my final post I would give you some gift ideas - for her, for him, and for pooch! Apologies if you have a cat - I'm definitely a dog person through and through so just had to pick goodies for doggies! An extremely girly 'For Her' list - basically, I picked things I would like. I'm a typical girly girl so for me, anything pink pretty much wins out. I think these gifts pretty much work for most women though - perhaps they don't ALL have to be pink, but things like candles, make up bags and lip balms are easy and (usually) successful pressies to get girls. I adore the Cath Kidston make up case, but of course there are cheaper alternatives in Primark if you're working to a budget. Boots have tonnes of fabulous makeup and beauty gift-sets for women, you really are spoilt for choice - in particular, I love their Hello Kitty Liberty stuff (although sometimes it's best to wait until these go in the sale - you know, if you end up wanting one for yourself too). I saw this Penguin dressing gown/robe on Topshop a few weeks ago and fell in love. They did a hare one similar to this last year that I missed out on, I just can't miss out this year! Although £32 for something I'm more than likely to spill Special K and soya milk down does make me weep a little bit inside. I actually don't own a Yankee Candle but would love someone to buy me one - scented candles are always a winner. Finally, if you have a friend who is a bookworm (ahem, me) and know they have a Kindle - this Kindle case is so cute and not that bad a price. I want it! Men. I detest buying for men. It's the same old stuff - socks, underwear, smellies. And they just release the SAME ones every single year. It makes me mad. However, I did manage to find a few things I thought were present-worthy. Men love gadgets - and there are always gadgety things for sale for men/boys at Christmas time. My boyfriend loves photography so something like the Diana Mini Camera would be perfect for him. Not exactly cheap as chips, but it's better than forking out £200+ on a camera lens and is another way of getting creative with photography. 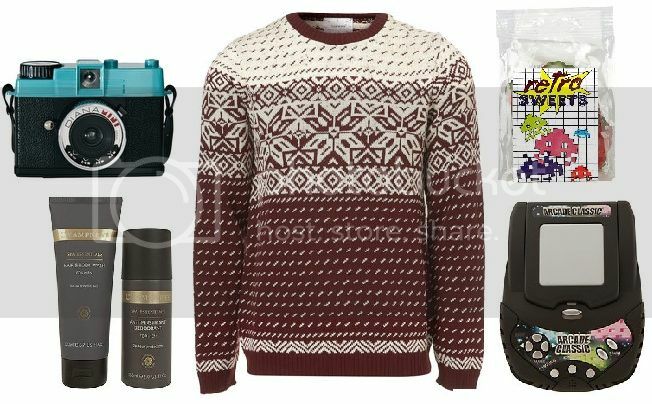 I don't know about you, but I LOVE Christmas/Fairisle/Snowflake jumpers. They just make me feel all warm and fuzzy inside. What's better than a Christmas jumper?! Your boyfriend/husband WEARING a Christmas jumper!! Yes. If I don't buy this for him, I'll probably buy it for myself. Gosh, I love Christmas! Sweets are always a winner with men - remember, men are like boys, so they generally like sweets and toys (we'll get into that in a bit). I had to throw in some smellies for good measure. Champneys is a nice brand so I don't feel too bad forking out a tenner on two products. Finally, men need their toys. Or gadgets, or whatever. I know if I got my boyfriend this he'd be over the moon - doesn't say much about my choice in men, does it? Anyway, a nice enough selection I think! I seriously love that jumper! I definitely had most fun putting this bit together. I adore buying stuff for my dog Rory at Christmas - I always go a bit mad and get him looooads and he spends all Christmas morning tearing my neatly-packed presents to pieces. I think dogs deserve a Christmas treat just as much as us humans! You can't go wrong with a cuddly toy, this Polar Bear from Pets at Home is so cute. I just couldn't resist putting this Christmas jumper in as well - if you thought your boyfriend in a Christmas jumper was cute - wait 'til you see your pup in one! I got one for Rory a couple of years ago from Accessorize and he looks seriously adorable in it. I think I need to buy him this one (also from Accessorize) too! I don't think a pooch should be without his posh collar, and these ones from Urban Pup are so pretty. I had to go for red, to fit with the Christmas theme, but they do loads of colours. You can even get customizable ones - your pup's name in diamantes! How fabulous?! Rory absolutely HATES baths so I try and use this 'Pet Head' Dry Clean stuff on him when he gets a bit pongy. It smells like Blueberry Muffins - yum! Finally, dogs need their chewy treats at Christmas time, and these munchy bones are perfect for little pooches. Sorted! I'll be cutting and sticking these lists into my scrapbook along with half of the Boots catalogue to help me out as the festive season draws nearer. I want to get all my shopping done as soon as I can so I can actually ENJOY the run-up to Christmas without being stressed out about it! I hope you've enjoyed my Christmassy posts, don't worry, I'll definitely be blogging more Christmas stuff as Christmas gets nearer, but I hope this has given you some ideas!